Download "Assignments include the following:"
3 be required to complete a Declaration for Federal Employment, OF-306. This is a Non- Critical, Moderate Risk Position subject to a favorable adjudicated background investigation. Subject to probationary period for 18 calendar months, which maybe extended The incumbent is required to drive a motor vehicle to conduct business at field locations. A valid State driver s license is required. All applicants MUST submit a current GSA Form 3607, Motor Vehicle Operator s License and Driving Record in order to receive consideration. Incumbent must possess a valid State Driver s License. All male applicants born after December 31, 1959, will be required to complete the certification document to confirm their selective service status. Government Housing IS NOT available. Relocation Expenses WILL NOT be paid. NOTE: Persons submitting incomplete applications will be given credit only for the information they provide. It is the applicant's responsibility to submit all required documentation in support of their application in order to receive full credit for their Veteran Preference determination, Indian Preference, education, training and/or experience. ADDITIONAL INFORMATION WILL NOT BE SOLICITED BY THIS OFFICE. Applications become part of the official record and will not be duplicated or returned. This office WILL NOT fax vacancy announcements AND WILL NOTaccept telefaxed applications. 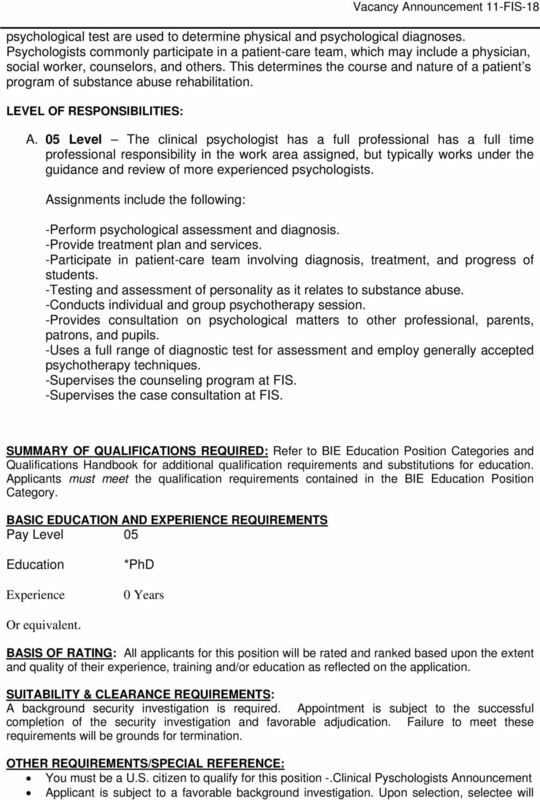 Applicant s qualifications will be evaluated solely on the information submitted by them in their applications. Applications mailed using Government postage and/or envelopes are in violation of OPM and Postal Regulations and will not be considered. ed applications/resumes will NOT be accepted. HOW TO APPLY: It is to your advantage to read the 'HOW TO APPLY' section of the OF-612, Application for Federal Employment, which contains guidance on the information that MUST BE included in your narrative application or resume to ensure your optimum consideration. The following forms must be submitted in order to have a complete application (preferably in the following order and list only which statement applies to advertised position) 1. Applicants may file using an OF-612, Application for Federal Employment, a resume or any other written format of the applicant's choice. In addition to the OF-612, applications, resumes or other written formats MUST CONTAIN: Job Announcement Number; Education; Work Experience (Position Title, Employment Dates (Mth/Yr), Salary); and Supervisor s name and telephone number. Also include information on other job qualifications and references. Application or resume must have original signature and current date, available at 2. Copy of College Transcript is required for verification/documentation (If selected, applicant must provide Official College Transcripts) 3. Form BIA 3100, Employee Performance Appraisal Plan (if applicable) 4. Form BIA 4432, Verification of Indian Preference for Employment, is required for claiming Indian Preference. 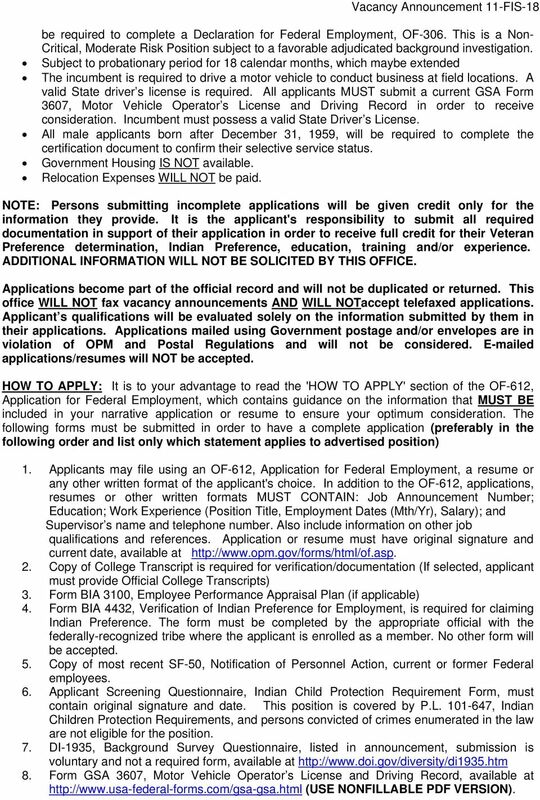 The form must be completed by the appropriate official with the federally-recognized tribe where the applicant is enrolled as a member. No other form will be accepted. 5. Copy of most recent SF-50, Notification of Personnel Action, current or former Federal employees. 6. Applicant Screening Questionnaire, Indian Child Protection Requirement Form, must contain original signature and date. This position is covered by P.L , Indian Children Protection Requirements, and persons convicted of crimes enumerated in the law are not eligible for the position. 7. DI-1935, Background Survey Questionnaire, listed in announcement, submission is voluntary and not a required form, available at 8. Form GSA 3607, Motor Vehicle Operator s License and Driving Record, available at (USE NONFILLABLE PDF VERSION). 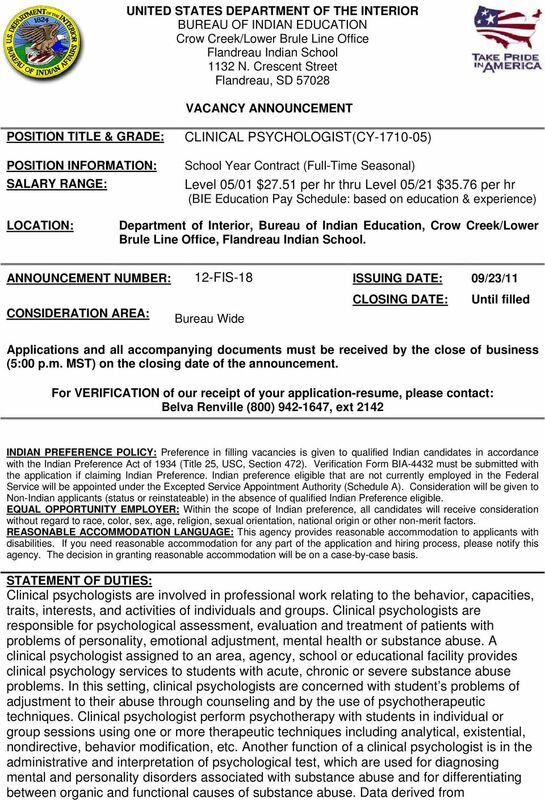 Winslow Indian Health Care Center, Inc. Employment Application 500 North Indiana Avenue, Winslow, Arizona 86047 Fax Number: (928) 289-8024 The Winslow Indian Health Care Center, Inc. is a tribal entity. Position Description Job Title: Bookstore Assistant Department: Business Office Supervisor: Chief Finance Officer Summary of Work: The Bookstore Assistant will assist the student billing/bookstore clerk. 115C-296. Board sets licensure requirements; reports; lateral entry and mentor programs. Health Link Services Nurse Aide Training Program #3950636 2921 East State Street, Hermitage, PA 16148 Phone: 724.981.7888 Ext. 103 Fax: 724.981. Submission Deadline: 1 August, 1 November, or 1 January (or first working Monday) Incomplete applications will not receive action. Thank you for your interest in the Chicago Public Schools Student Teaching Program! 3344-60-01 Employee background screening policy. GENERAL INFORMATION Last Name First Name M.I. Name You Prefer Mailing Address How long at this address? City State Zip County If less than a year, previous address How long have you resided in the county? Policies Criminal History Background Checks for and Promotion Definitions Security sensitive areas are all of the physical locations at the utmbhealth (UTMB) designated by the President or his designee.